A quest for that insider’s view which I searched for everywhere seemed to end. The real Switzerland, where grass meadows shine bringing in much focus to the land of the Poultry and the Goldsmith was in front of me. And I standing unperturbed was yodeling at the highest pitch of my vocals. This is the Switzerland I wanted to know, really up close - where Traditions followed and are still part of the customs and festivals which are held in this part of the city - where very fine hand needle work embroidery continues to be part of the culture and so is farming. It looked to me more of countryside I was wanting to explore more. We took a train from St. Gallen to Appenzeller. In 1560’s the land of Appenzeller was in fire which destroyed everything except the tower and the church. During the reformation period in the 16th Century, Applenzell was divided into Half Cantons - The Blue area marking Catholics and the Yellow marking Protestants. 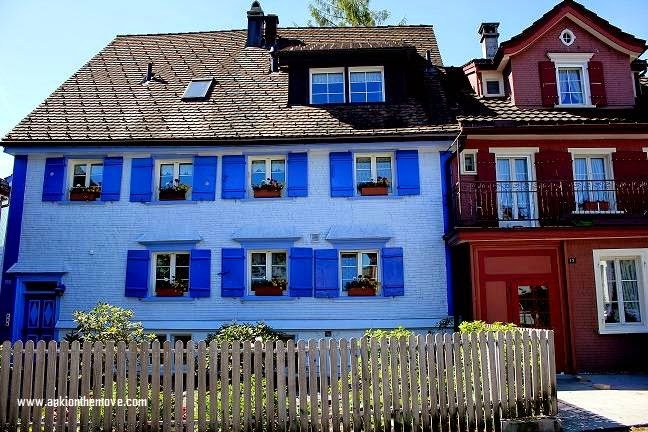 Appezeller is one of the smallest Cantons having a population of just about 16000.Of which 4000 people live in the main Appezell city. 30% of the population here works as farmers and a lot of handicrafts, and then is tourism. They have a lot of industries set here - small textile companies which is also very important to the region. Then are shops having traditional farm painting which is primarily Oil Color on word and traditional leather work which is decorated with brass and the traditional Jewelry. Here there are saddlers, coppers, silversmiths, hand embroidery, homely restaurant and family run hotels. 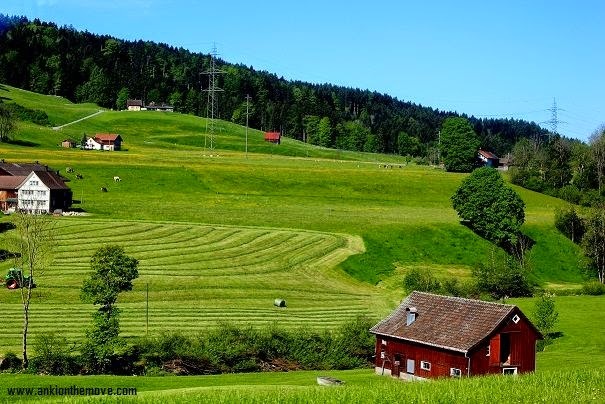 Now since most of the income here are from Farmers, who take their cattle up to the mountain area and stay for 3 months and come back, they produce a whole lot of Appenzeller Cheese which is very famous in Switzerland. There are 4 variants of Cheese which we tasted - one was mild, another little stronger, then stronger and then strongest in terms of flavors. The strongest isn't consumed direct but added as Macaroni or Cheese Tart. The longer the cheese is in cellar the costlier it gets. The classic or the mild cheese is kept in Cellar for 3 months, the next one for 5 months, the next next for 7-8 months and the strongest for 9 months. Many hundred tones of this cheese is exported worldwide. 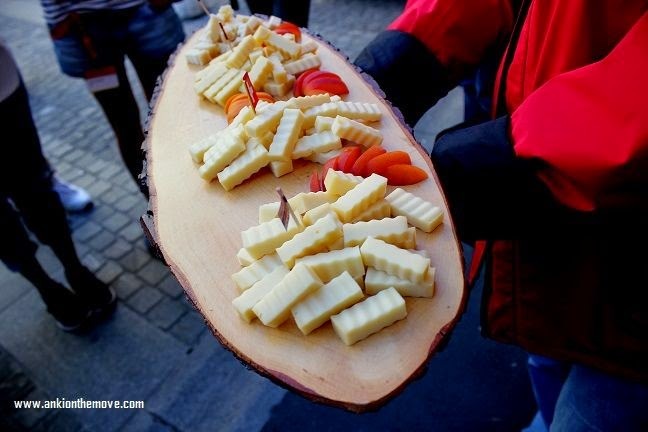 So now when you are coming back from Switzerland you know what to bring back, but be sure, you take it and refrigerate it as soon as you get back because Cheese as we all know has short shelf life in open. 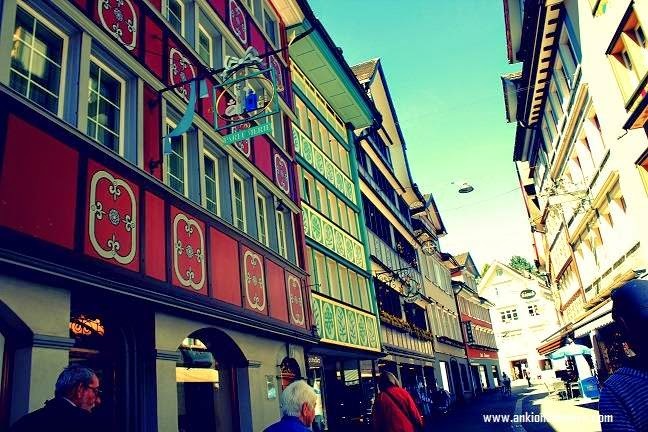 Hersheys family grew up in Appenzell.Does that surprise you? But if you are a beer lover, there’s also good news for you in the city. 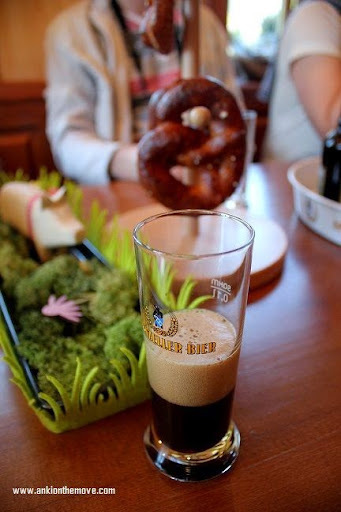 Consisting of 60 different types of Beers, this small Brewery in Appenzeller has adequate options to keep you high. When we tasted the variants of beer starting from the light lemon beer to the weed beer to the wheat beer to the full moon beer (the people actually work on full moon to brew this beer) to the shocking Fire Extinguisher, you’d love to be having it all. Fire Extinguisher Beer was actually the name given at the exhibition 5 years remembering the fire that burnt the village. So,whats the difference between Beer tasting and Wine tasting? when you do a serious wine tasting you have to spit it out.beer,you should not spit it out because on your tongue are the different areas, sweet on the side, sour and salted and bitter at the end of the tongue.one sip and then sips to taste the bitterness. 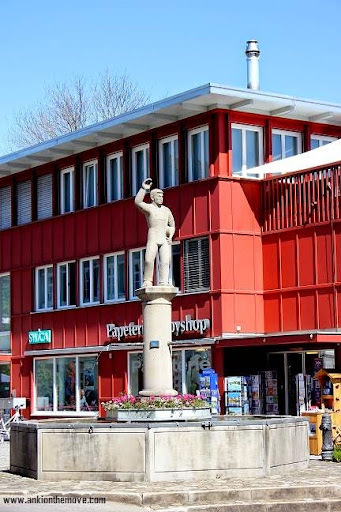 Appenzeller: Open Air Parliament:Hands Up Anyone? Following old political system since 1403,On every last Sunday in April, in the main square of Appenzell is where the voting takes place once in a year and that is so by "Holding Hands Up”.Since the population is near about 4000,the counting begins then and in the same way the mayor and the members of the government is chosen. Sometimes when there is confusion in the number which in last election is believed to have happened thrice, so the people who supported one candidate had to walk to the right and another to the left .Anybody can talk for something against/for which is by the way how democracy should be. 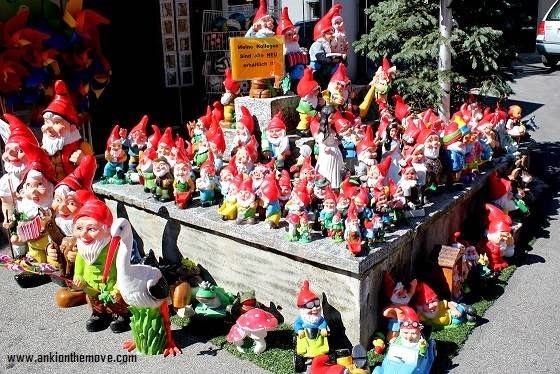 For now ,they have 6 men and 1 women in the Economy and Education departments chosen like this. For people who are new-comers in the town they need to have entrance card,rest everyone can just come and vote. Appenzell was also the last canton to give the right to vote for the women since 1972(for federal matters we can vote but for canton matters until 1972). Crossing the bridge over the Rhine river, we thought of having a wine on a movable round about which was the idea of the artist. Every creation that he created was an art in movement in fact this one would turn around every 3 minutes in the middle of the road. 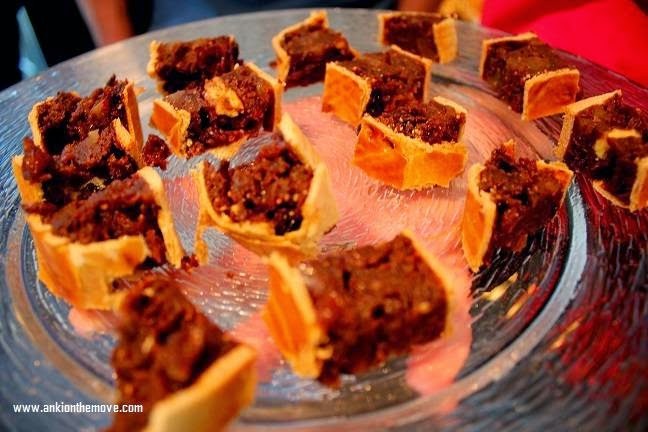 Do check out Corpus Christi(processions),New Year Mummers, Bonfire and many others .In Appenzell they also celebrate Christmas Trees with Ginger breads on Christmas .Is this like really something! Link to dates of festival this year is here. 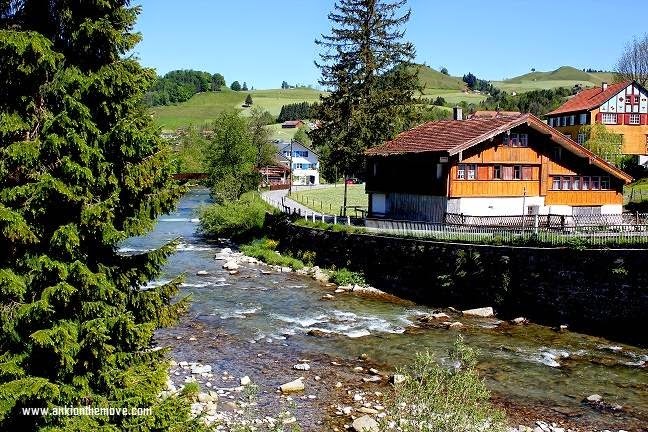 @Mahesh Divya:Thanks Mahesh,Switzerland is a beautiful place,I can easily spend a month there! @Haddock:Swiss frames are unreal.It's too good to be true.Guess what its also my favourite.